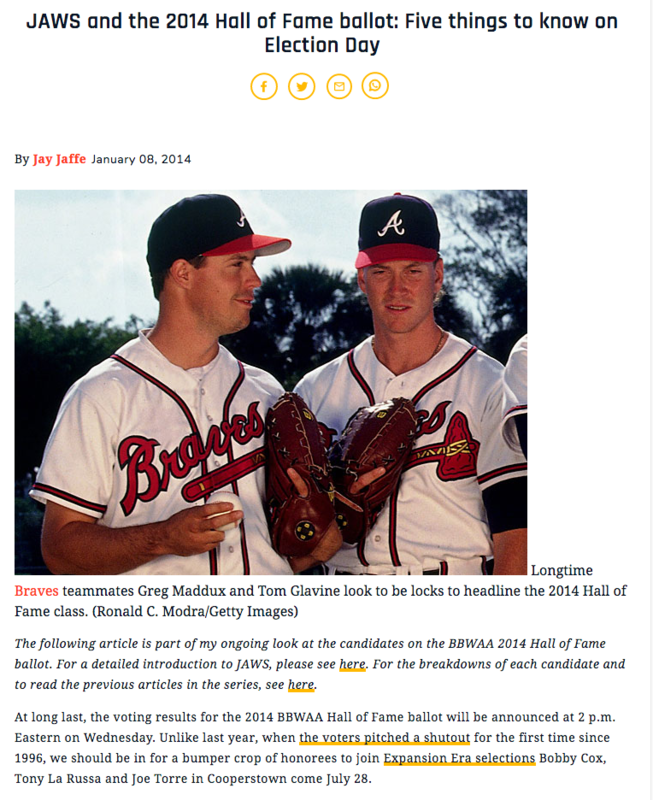 Part of my ongoing effort to catalog my Hall of Fame-related coverage at Baseball Prospectus for this site. A recent design change at BP may result in formatting issues. 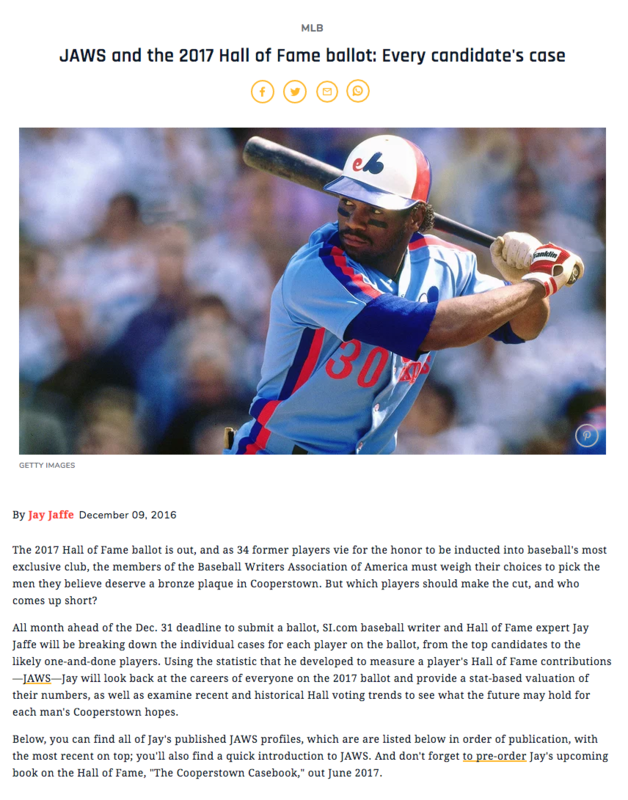 In November or December 2004, Baseball Prospectus invited me to contribute an article or articles analyzing the BBWAA ballot, drawing upon the work I had done at FutilityInfielder.com during the previous two winters. The result, which was not yet called JAWS, used Baseball Prospectus’ still-new Wins Above Replacement Player metric (created by Clay Davenport), which used a significantly lower replacement level than today’s WAR, and a definition of peak based on a player’s best five-year run, with allowances made for injuries or military service. 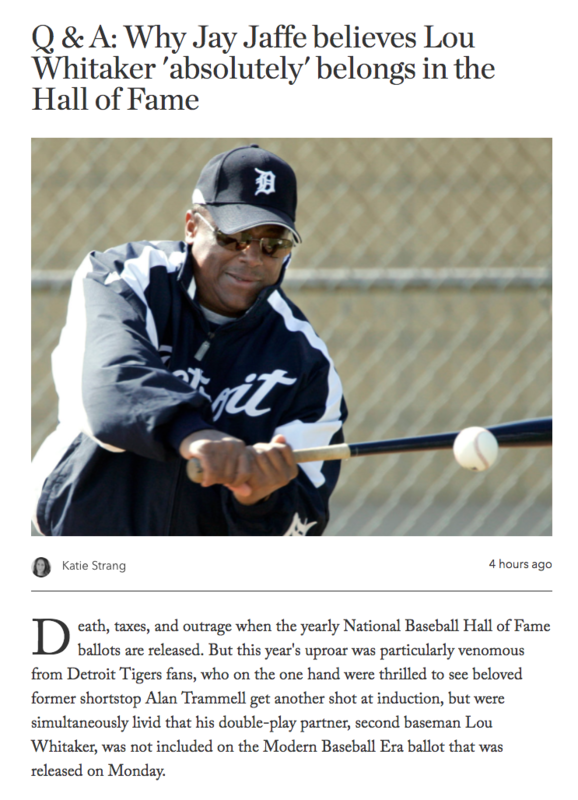 In the wake of the Modern Baseball Era Committee ballot announcement earlier this week — a ballot I’ll cover soon enough at SI.com — I spoke to Katie Strang, managing editor and senior writer for the Detroit outpost of The Athletic. With Alan Trammell and Jack Morris both among the 10 candidates on the ballot, our conversation centered around the omission of their longtime teammate Lou Whitaker, who like Trammell is one of the Case Studies in the Casebook. [Bobby] Grich and [Lou] Whitaker, both hailing from the same time period more or less… have both gotten particularly screwed by the voters, and essentially for the same reasons. They both fell short of the minimum five percent in their lone BBWAA ballot appearance and that has been held against them when the historical overview committees have built the Veterans Committee ballots, the Era Committee ballots. It’s a really unfortunate way of reinforcing a judgment that I don’t think was intended to be as final as it has become. I do think it’s alarming though, the way that has become reinforced. The prevailing notion of the day was some voters just refused to ever vote for anyone on the first ballot unless they were Hank Aaron, you know — a slam dunk. But they assumed they’d have a chance to vote for these guys at a future date. …Whitaker had a reputation with being relatively aloof as far as the media was concerned. I don’t think that helped him, either. I think it’s entirely possible that race played into it as well. 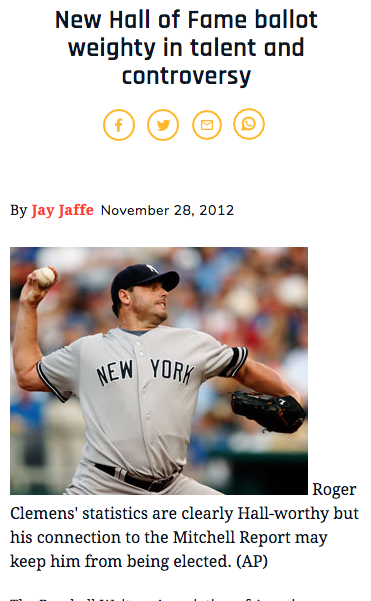 I know that sportswriters now still tend to be white middle-aged men that aren’t maybe the most culturally-sensitive. And back then, it was whiter to an even greater degree. Reading some of the coverage, it’s clear that Whitaker would not have been alone in terms of a disconnect with the middle-aged white writers of the day. Also on the topic of Whitaker, The Detroit News’ Lynn Henning (to whom I spoke for the Casebook) cited my work in railing against his omission from the ballot. In his time, almost nobody thought of “Big Daddy” in a Cooperstown context, but the portly 6´3˝ righty showed impressive staying power during his 19-year career and stacks up well in light of WAR. 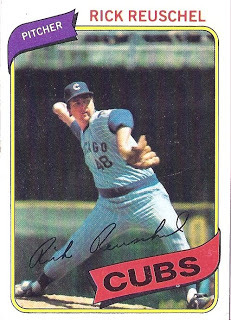 He spent most of his first dozen seasons with the Cubs, his strong run prevention under heavy workloads often going unnoticed amid mediocre won-loss records — he was 135-127 during his Chicago years — though a 20-10 1977 season did get some attention; he led the NL with 9.4 WAR and finished third in the Cy Young voting. A brief foray to the Yankees resulted in a trip to the 1981 World Series and a torn rotator cuff that cost him all of 1982 and most of ’83-84, but he resurfaced as a strong starter in Pittsburgh and then San Francisco, helping the Giants to two playoff appearances and the 1989 World Series in his age-40 season. BBWAA voters almost completely ignored him, and he’s unlikely to break through via committee, but he’s 32nd in career WAR, ahead of many no-doubt Hall of Famers. In the wake of my SI.com article on the Hall of Fame chances for Justin Verlander, Carlos Beltran and other players we saw in the postseason, I spoke to the great Dan Patrick on his radio show. We touched on Verlander, CC Sabathia and current candidates as well such as Mike Mussina and Curt Schilling, and he gave the book a plug. John pitched more seasons in the majors than anyone except Nolan Ryan. That’s thanks to his role as the recipient of the most famous sports medicine procedure of all time, the elbow ligament replacement surgery performed by Dr. Frank Jobe in 1974 that is now named for John. 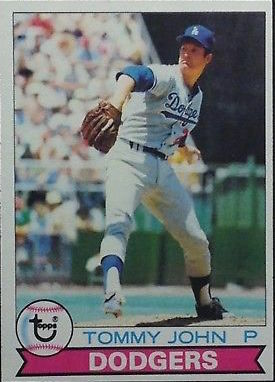 His biggest years came after the surgery; from 1977-81, he placed in the top five in Cy Young voting three times, won 20 or more games three times and pitched in three World Series for the Dodgers and Yankees, though all on the losing side. Despite that modest peak, he’s more a compiler than a star. A groundballer who didn’t miss many bats (just 4.3 K/9), he had just four seasons of 5.0 WAR, and never led his league in any triple crown category. While he came close to 300 wins, he surpasses only Don Sutton’s peak WAR and Early Wynn’s career WAR among the 24 members of the 300 win club. Given that he topped out at 31.7% of the vote, you’d have to apply an extremely large bonus for the surgery to make the case that he merits enshrinement. 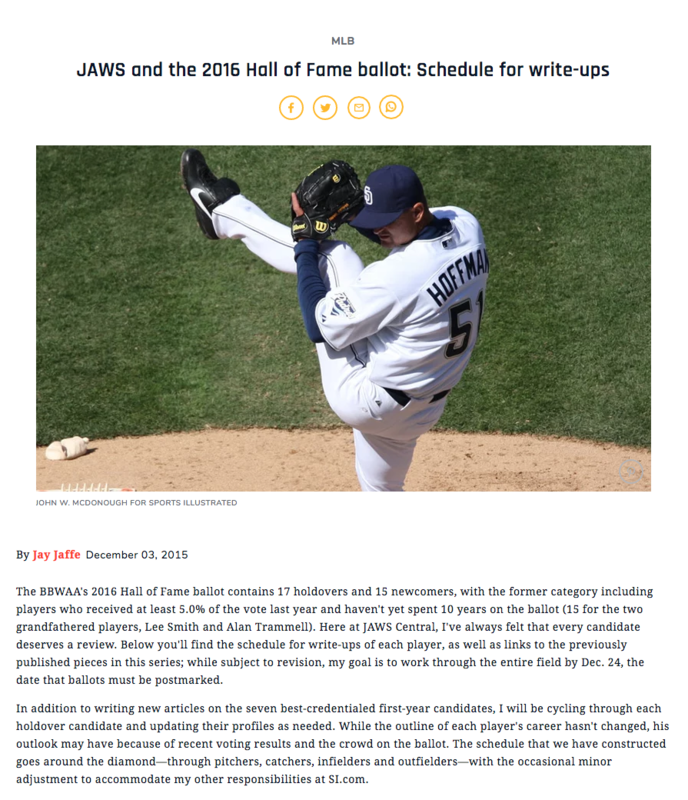 Considered on the 2011 and 2014 Expansion Era Committee ballots, he’s up again in 2018, but the Hall’s decision to honor him in tandem with Dr. Jobe in 2013 may be as close as he ever gets. 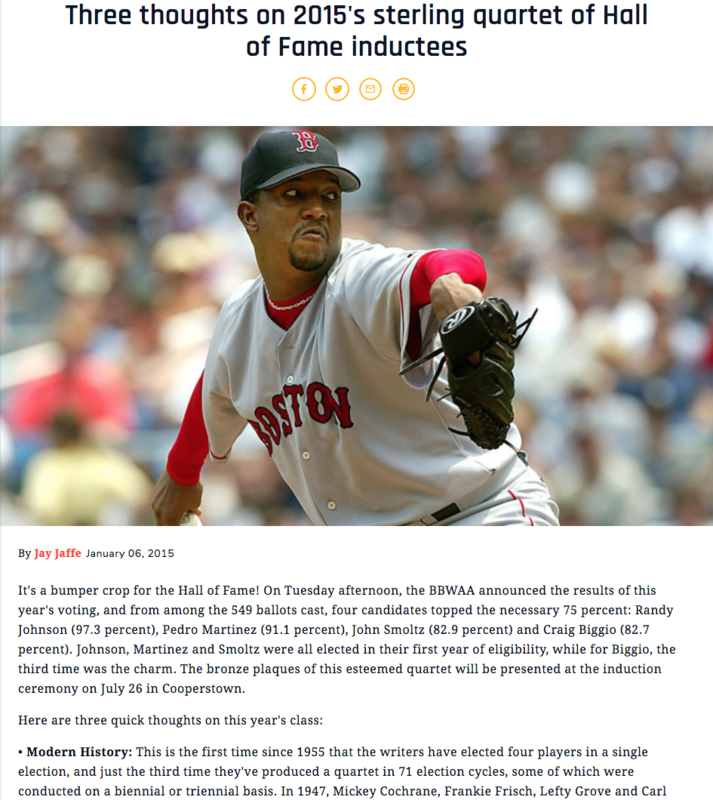 Part of my ongoing effort to catalog my Hall of Fame-related coverage at SI.com for this site.